School of Management, Chongqing Jiaotong University, Chongqing, China. Received March 5th, 2009; revised May 7th, 2009; accepted June 12th, 2009.
realistic assumpt ion s an d hence can explain real ec on o mic beh avio rs mo r e pro perly . into the framework of utility maximization. given in Sectio n 7. Fi nal ly, Section 8 dra ws c onclusion. will be returned and an y spiteful action will be retaliated . derived from his payment . lows. First, the principal offers a contract to the agents. ized and the transfers are made. both his own outp ut and oth er s ’ output. 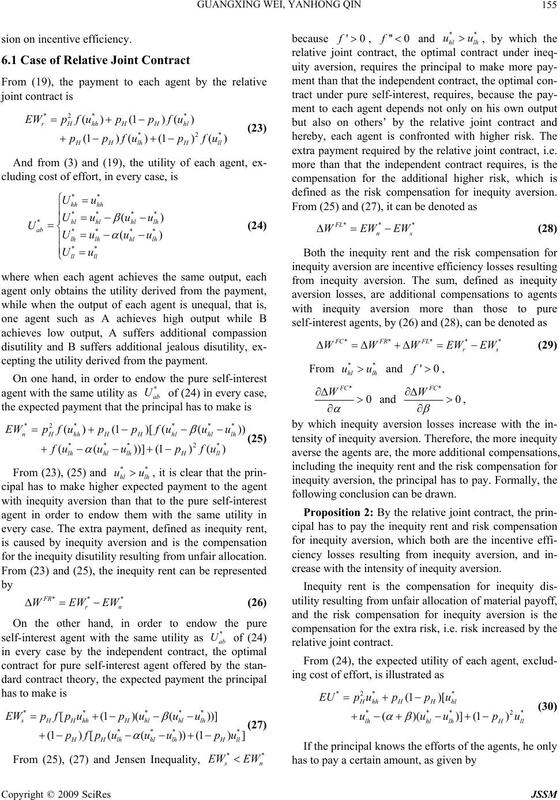 contract for multiple agents with inequity aversion. contract equals that by contract . same as the right-hand side of (15). Then, (14) holds. 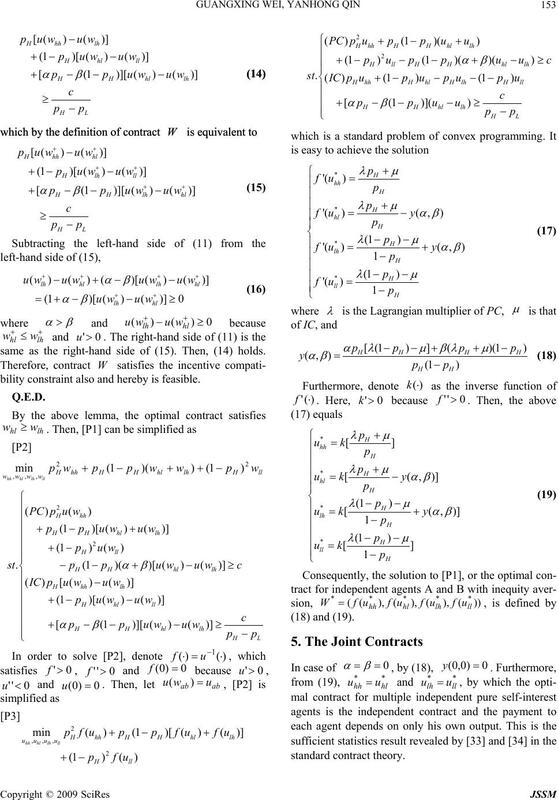 bility constraint also and hereby is feasible. sion is the egalitarian joint contract. cepting the utility d erived from the payment. for the inequity disutility res ulting from unfair allocation. extra payment required by the relative joint contract, i.e. defined as the risk compensation for inequity aversion. following conclusion can be drawn. crease with the intensity of inequity aversion. which is proved in the follo wing subsection. 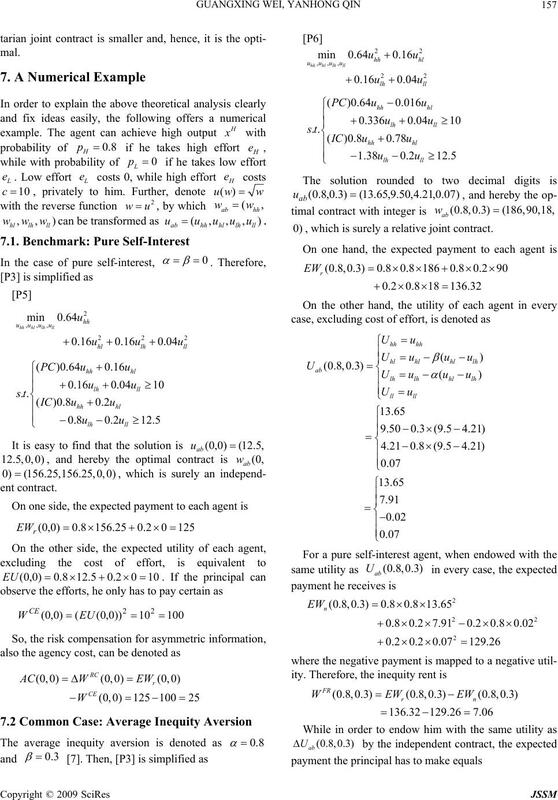 , which is surely a relative joint contract. examined. The results in every case are given in Table 1. From Table 1, the following conclusions can be drawn. of inequity aversion any more. 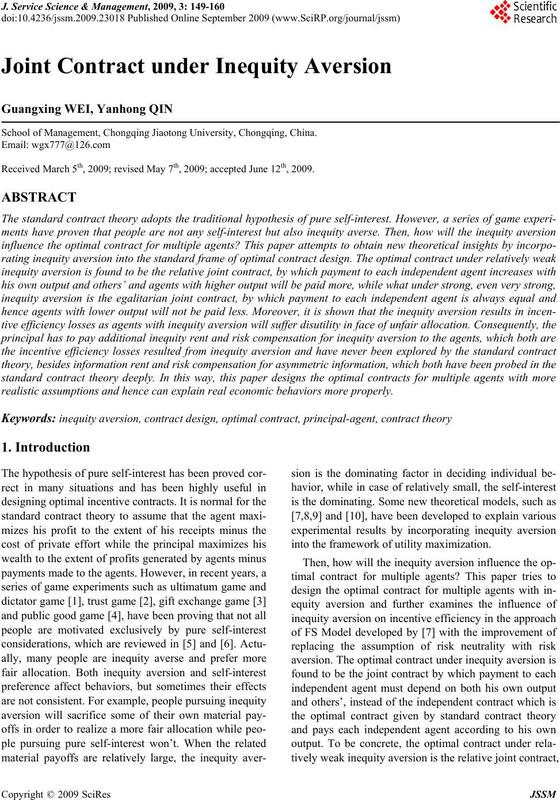 centive efficiency losses resulting from inequity aversion . 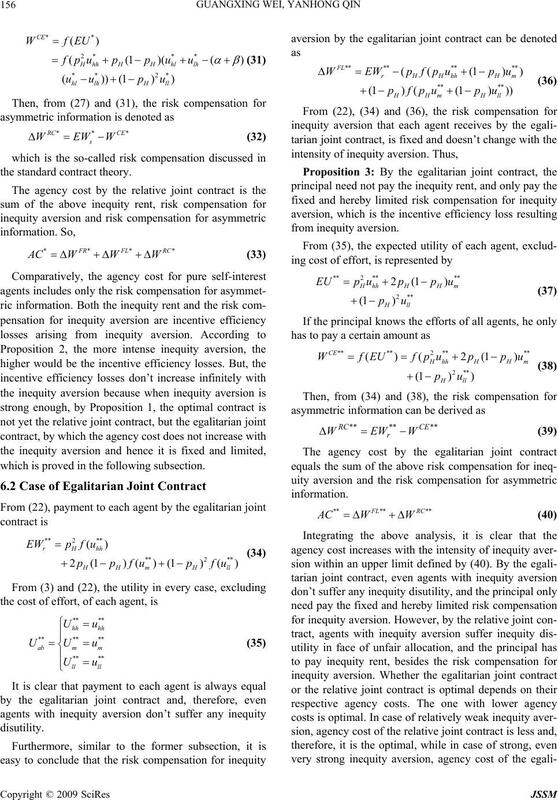 contract investigated in the standard contract theory. economic behaviors can be explained more properly. discuss evaluation and screening of inequity aversion. able. Finally, what is the scope of the reference group? questions are worth exploring further. 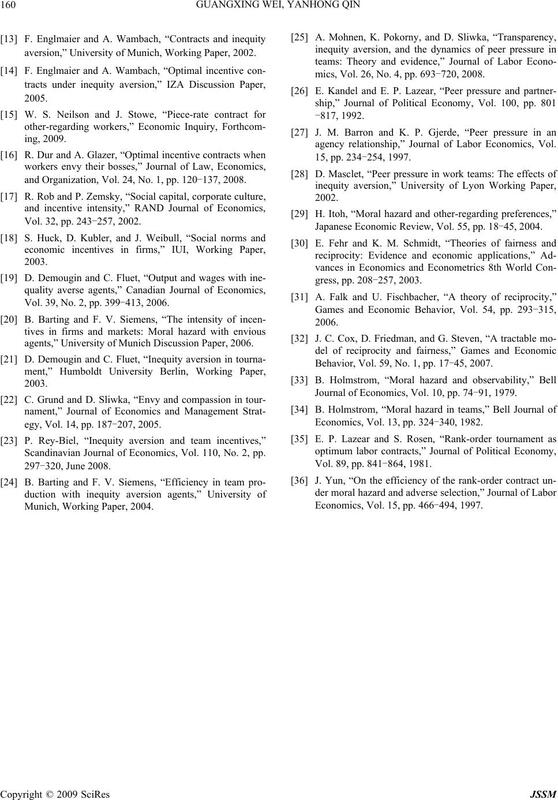 and social history,” Games and Economic Behavior, Vol. 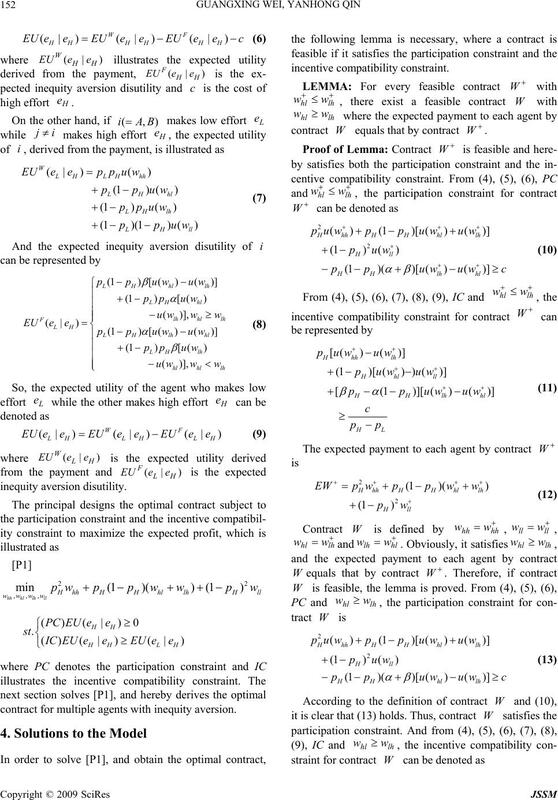 nomics, Vol. 11, pp. 437-460, 1993. Vol. 90, pp. 980-994, 2000.
ics, Vol. 114, pp. 817-868, 1999.
view, Vol. 90, pp. 166-193, 2000.
economics,” American Economic Review, Vol. 83, pp. Vol. 47, pp. 269-298, 2004.
havior, Vol. 62, pp. 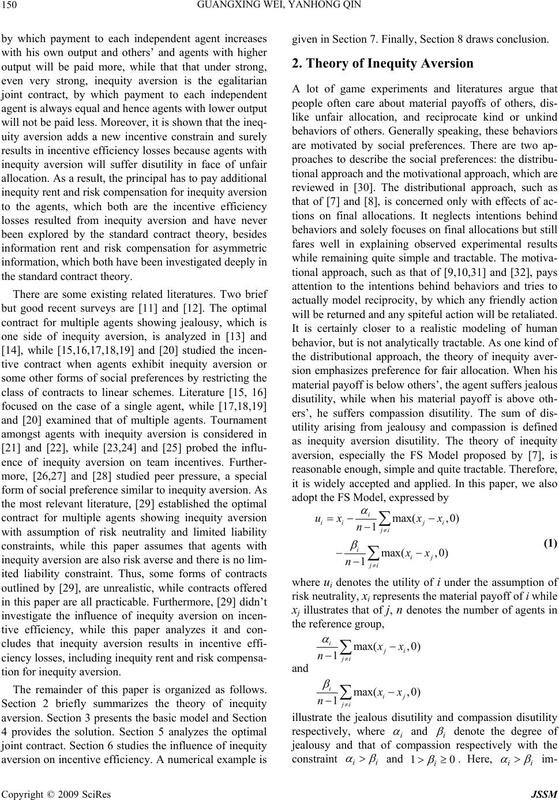 287-303, 2008.
aversion,” University of Munich, Working Paper, 2002.
and Organization, Vol. 24, No. 1, pp. 120-137, 2008. Vol. 32, pp. 243-257, 2002. Vol. 39, No. 2, pp. 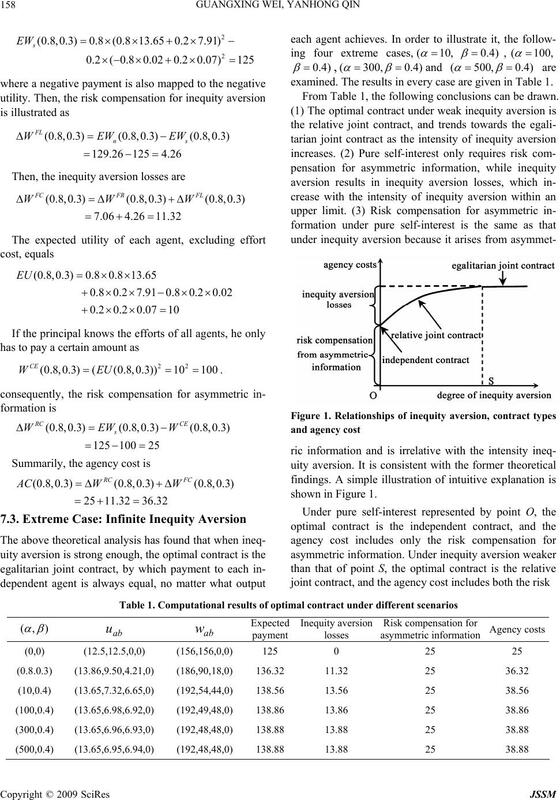 399-413, 2006.
agents,” University of Munich Discussion Paper, 2006.
egy, Vol. 14, pp. 187-207, 2005. 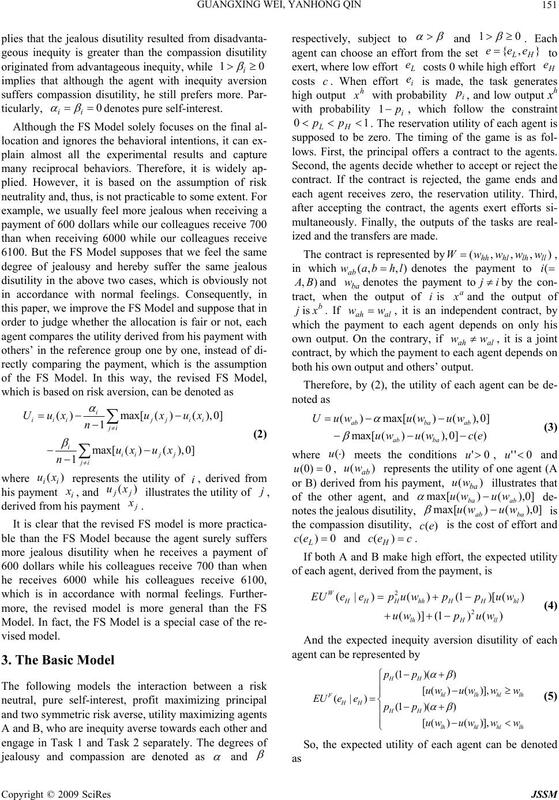 Scandinavian Journal of Economics, Vol. 110, No. 2, pp. mics, Vol. 26, No. 4, pp. 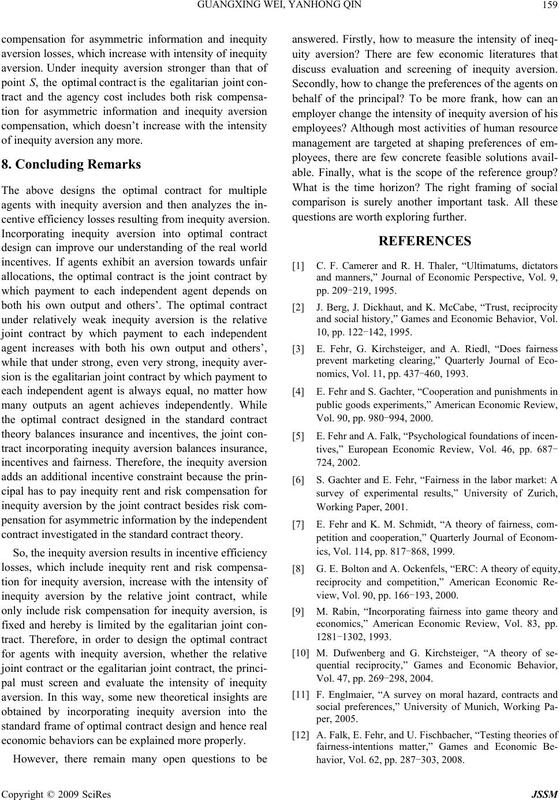 693-720, 2008.
agency relationship,” Journal of Labor Economics, Vol. Japanese Economic Review, Vol. 55, pp. 18-45, 2004. Behavior, Vol. 59, No. 1, pp. 17-45, 2007. 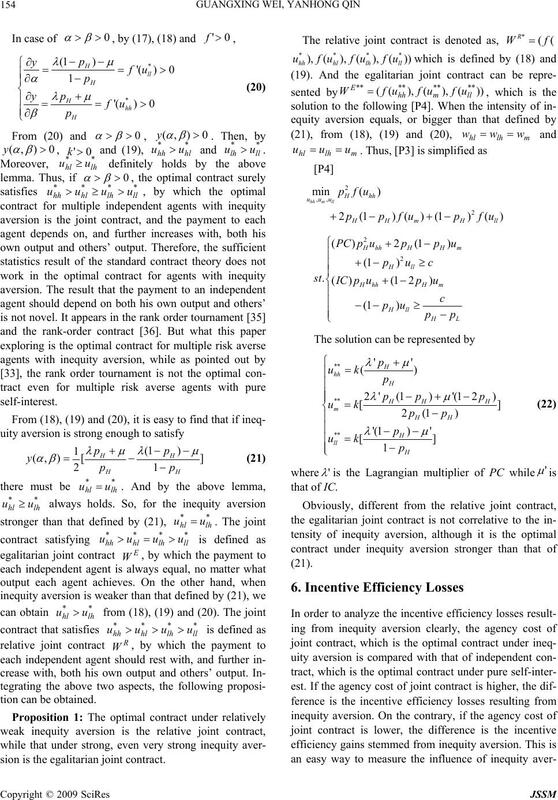 Journal of Economics, Vol. 10, pp. 74-91, 1979. Economics, Vol. 13, pp. 324-340, 1982. Vol. 89, pp. 841-864, 1981. Economics, Vol. 15, pp. 466-494, 1997.